Imagine that you’re thinking about hiring a marketing agency. Assuming that you don’t have infinite money and you’re actually looking to make a smart decision, you’ll probably want to know a lot about what the agency will offer. How much will I get out of it? Ideally, you want the second part–the value that you get–to exceed the first part. In other words, you want to generate a positive ROI on your investment in a marketing agency. For some kinds of marketing, this is a straightforward calculation. If you’re doing PPC ads, then you just take the total spend on ads plus the agency fees and divide it by the total number of dollars that the activity generated in sales, leads, etc. But, what about investing in SEO? Isn’t it “free” traffic? How do you determine the value of something that has no price associated with it? How can you decide if you should bother investing in SEO in the first place? Luckily, there are a few ways to gauge the value and decide if it’s a worthy investment. I’m going to show you how. The investment part is pretty straightforward. There are different ways you can assign costs, but at the end of the day, you basically know how much you’re spending to hire an agency. So let’s focus on the second part of the equation. How do you know how much organic search traffic is worth? Math is hard. Get a free spreadsheet that automatically calculates SEO value and ROI based on the formulas shown in this post. For the purposes of this post, I’m going to use a made up t-shirt eCommerce website, “Creative Ink Cloth” to give you an example as you follow along. Creative Ink Cloth produces awesome, but reasonably priced, t-shirts. By studying our purchase data, we know that the average order size per customer is about $50 and that about 1.3% of their visitors convert into customers. So, where did we get these numbers? And how can you calculate it on your own? That’s what the rest of this post is going to tell you. They each have some pros and cons. Ahrefs requires a paid subscription (starting at $99/month) but includes a lot of robust keyword data. 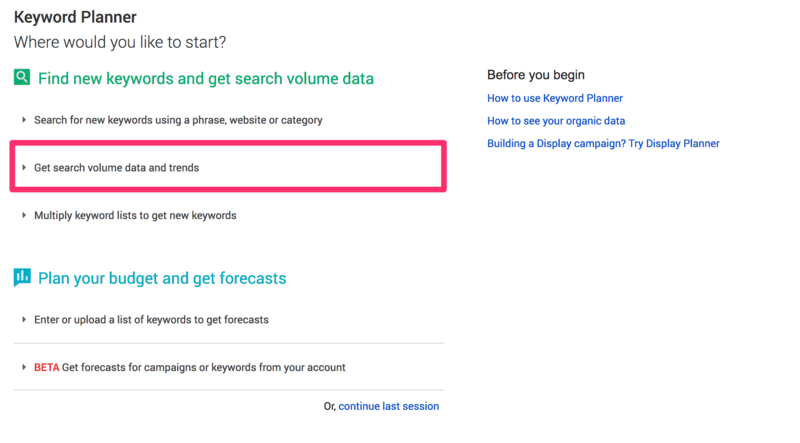 Google’s Keyword Planner tool is free if you sign up for an AdWords account, but the data isn’t great and they now give just a range of keyword traffic. To do our calculations, we are going to use both tools because Ahrefs’ Keywords Explorer goes into more detail and Keyword Planner gives us CPC bid data. I’ll first show you how to find the data on Keyword Planner and then on Ahrefs. Load up your Google AdWords account (you’ll need to create one or log in). To find the tool click on Tools -> Keyword Planner. You’ll see a few options here. Enter the keywords you would like to get data for in the text box. You’ll want to note the “Suggested bid” of your target keyword. This tells you the estimated cost to buy one click from this keyword through Google AdWords. We’ll use this in step 3. If you’re using another tool like Ahrefs that has more exact keyword search volume data, then you can ignore the average monthly searches shown here. If not, and AdWords is giving you a giant range like this (which happens for most low-spending or no-spending AdWords accounts), then you can do a few tricks to get a better picture of your keyword search volume. If you’re going to use the Ahrefs Keyword Explorer, you’ll be able to get deeper information about the keywords you’re targeting. It’s not 100% necessary for the sake of this process, but it might be worth investigating for other uses. Go to Ahrefs and open Keywords Explorer. Then type in the keywords you selected earlier and click on the search button. Select the “Metrics” tab to see more information about each keyword. We are going to focus on just the monthly volume for now, but you can click on each keyword to get detailed information. This data shows you an estimate of the search volume, but also helps you gauge the relative competitiveness of the term (from an organic standpoint) and provides other useful metrics. As you can see below, the Ahrefs tool also shows you things like how many backlinks you’d need to be the top-ranked search result for a particular keyword, the difficulty (competition), and search volume. It also gives you other, related keyword ideas. The number that we found here–the total monthly search volume–is the first number of our equation from above. Since we’re just calculating it for the “cheap t shirts” term for right now, we’ll start with that number (14,000). We’ve taken our first step toward getting a final value. But we have more work to do. On to the next number, nerds. Now that we know the volume of searches for each keyword, we can begin to estimate the traffic to a website. So how do we calculate that? While it’s widely known that a higher search engine ranking results in more organic traffic, many marketers overlook the impact. Advanced Web Ranking has a nifty tool that tracks search rankings versus the click-through rate (CTR). This tool will tell us what percentage of searchers are likely to click on our link, based on the position that we achieve in the SERPs. You can segment the results by device, search intent and ads. But, overall the numbers are fairly consistent with the #1 spot taking most of the traffic. As you can see from the chart, having an average position of 1 in the SERPS can have a pretty significant impact on your organic traffic. Nearly 35% of clicks go to the first link while the second link gets around 15%. Since our goal is to achieve position #1 for “cheap t shirts”, we are going to use the statistical click-through rate of a #1 ranking (35%) for our second number. These two numbers, together represent the estimated monthly traffic that we will receive by ranking #1 for our target keyword (4,900). This is half the equation. But in order to convert that into dollars and cents, we need to calculate how much each of those visits is worth. Let’s start crunching some numbers to assign a dollar value to those visitors. Valuing search traffic on a per-visit basis is not an easy feat. This is, by far, the most difficult part of the equation, depending on how you calculate it. Neither of these methods is quite perfect, but they each offer their own benefits. 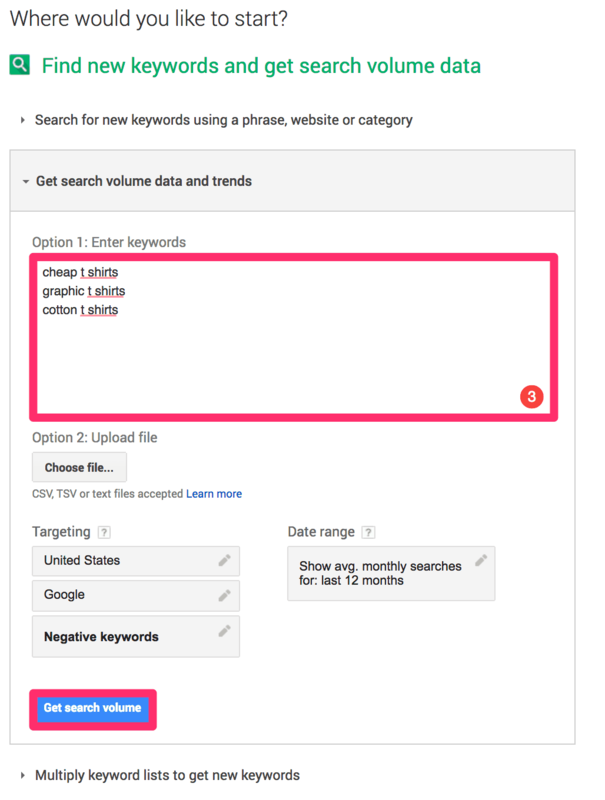 The first method is less accurate, but it’s very simple to obtain and can be pulled directly out of the Google Keyword Planner. The logic for this method is that if you had to buy the same amount of traffic, you would have paid the CPC bid rate to get those visits to your website. We can calculate the value of the traffic by using AdWord’s suggested CPC bid for the keyword that we want to rank for. This method only quantifies how much you would pay for a PPC campaign to get similar traffic to your website. But it does not ascribe any value to the actual revenue that you generate from it. If we take this simple method, we can plug it into our equation and get the value of traffic based on our estimated website traffic (search volume * CTR) and the CPC bid. If we use method #1, then our value per click is $2.14. This means that ranking #1 for “cheap t shirts” is worth about $10,000 per month. You can use this method if you want to quickly value traffic, but it doesn’t accurately measure which keywords are most valuable to your business. If clicks for “cheap t shirts” generate $5 in revenue per click, then the real value of that organic traffic is $5 per visit (it’s 100% profit). And that’s where the “Real Money Method” comes into play. For the second method, you need to have Google Analytics installed on your website and have set up goals and conversion values. Let’s start with the hard part. What we’re going to do is look at our keyword and find out which landing page it is driving traffic to. In most cases, your website will only have one page that shows up first for a particular keyword, or if you are starting a new site, then you should have a particular page that is optimized for a single keyword. If you have an existing site, you can do this by either manually Googling the term and finding the page that first appears or by using a tool like Ahrefs to tell you which pages rank for specific keywords. Either way, you want to determine the landing page that correlates with your target keyword. In this particular case, we are going to assume that “cheap t shirts” is sending traffic to Creative Ink’s homepage. So what we want to know is: What is the conversion rate of website traffic coming from organic search and landing on the homepage? We can see this from Google Analytics by going to Behavior -> Landing Pages and then selecting the Secondary Dimension as “Default Channel Grouping” (or applying a segment to the report for “Organic Search” traffic). From this example, we know that the homepage has a conversion rate of 1.28% specifically for traffic coming from organic searches. So, if visitors convert at 1.28% then we need to know how much they’re spending. Assume we know that our average order value is $50. We can conclude that every visit from organic search to the homepage is worth approximately $0.64. Editor’s note: Now, before the super analytics geeks get out their pitchforks, I want to say that, yes, this could be done in a more precise manner. This would require looking specifically at traffic coming to the homepage only from a particular keyword and then also looking at the average order value only for traffic from that same particular keyword. But this data is not easy to get. So, for the sake of simplicity, we will use these approximations. Another note: While we are using eCommerce as an example, you can apply this methodology to any kind of business. For example, if you have a service business then you may assign a value for every lead brought to you. You’ll just need to assign goal values inside Google Analytics. So, we now have two different calculations for the value of a visit. In the final step, we’ll bring each of our numbers together to do the math. All of that crunching and calculating was basically to give us just three numbers that we need to plug into our initial equation. Since we went through the trouble of doing the “Real Money Method” to calculate the value of each visit, we’ll use that in our formula. But you could substitute the CPC for that part of the equation if it’s all you have. Or, our original calculation: $3,136 per month. But don’t forget, what we really want to calculate is ROI. In this scenario, we are going to assume that the company ranked very, very low before getting SEO help. So the entire value of the #1 spot is their return. If they were simply improving, say, from #5 -> #1, then you’d need to do the calculation for both positions and subtract to get the return. We’ll also assume that the company has invested $5,000 in SEO help. The ROI for one month is -37%. But don’t fret just yet: This is just for a single month. We should think about the value in terms of its residual return over time. After all, you aren’t investing in SEO help just to rank #1 for a single month. That value keeps adding up. So, if our return for a single month was $3,136, what is the long-term value? If we assume that our initial investment gets us to the #1 ranking and we stay there for 6 months, then the total return is $18,816 ($3,136 * 6 months). That’s an ROI of 276% on our initial $5,000 spend in just 6 months. That’s not a bad way to spend your marketing dollars. SERIOUSLY, GET THIS. IT’S WAY EASIER. Download this free spreadsheet that automatically calculates SEO value and ROI based on the formulas shown in this post. Yet, this is still just part of the picture. We’ve only calculated the value of increasing a single keyword. In nearly any SEO engagement, you can count on the fact that you won’t just see improvement in a single keyword. You’ll see a boost in rankings across a number of different relevant keywords as your entire domain’s authority rises and you bring in more search traffic. That means you could easily see a return that’s 5-, 10-, or even 100-times what we calculated for this single keyword. When’s the last time you had a 28,000% ROI on your marketing spend? Organic search traffic may drive a certain percentage of conversions to your website as a direct conversion (e.g., person searches, clicks, and buys). But, an astute analyst will point out that this is not always the typical buying path. In fact, this kind of attribution (generally called last-touch) may only be the tip of the iceberg. Organic search is also generally a huge first-touch opportunity. Many users discover a website through search, look at the products, and then leave. They may later come back through email, social, or direct to the site to buy later. This would make it an “assisted conversion,” which may not be included in your Google Analytics data. In order to calculate the full value of these assisted conversions, you’d have to weight the value of that touchpoint within your conversion process. Read: A lot more math. For the sake of your sanity–and ours–we won’t extrapolate into more detail about the math behind calculating these values. But, you should know that this valuation is really only part of the full story. There’s probably more value to be calculated than you’ll ever want to actually add up. To end a long story with a short one, the takeaway from today’s math lesson is that the value of strong SEO can be huge. If done well, it can provide ongoing, compounding value that can be directly calculated and measured just like any other marketing effort. I'm a digital strategist and writer. I've spent years studying effective content marketing and SEO and worked with companies ranging from consumer apps to healthcare to grow their businesses. Truly amazing post Prateek. Thanks! Hi Preateek under Step 5 adding it all up, How can you assume that you will stay ranked #1 for 6 months how did you make your estimation, do you have any reference on that? Thanks. Enter your email to receive a free copy of the SEO ROI calculation sheet, which calculates the total value and ROI of investing in SEO based on specific keywords.